Would $100 Change Your Life? It’s a small sum, right? Seriously, we spent that on dinner and drinks last night. And yet it is what will propel me through the next Giant Step. It’s not the sum, but the investment. The investment in me; that I can be more, do more, reach more. Not the amount, but the responsibility. My responsibility to live up to the expectation of what is possible. Not the number, but the trust. Trust that I will use it wisely, thoughtfully, and respectfully. Not the dollars and cents, but the example. Of being remarkable. Kind. Generous. Trusting. Reaching. Successful. I may have left for the weekend filled with angst, self pity and doubt; worrying we aren’t getting anywhere quickly and that opportunities existed outside of my reach. But I return realizing that I’m just not reaching far enough. That I need to make an investment in myself, take hold of the responsibility, trust that I have what it takes, and be an example to myself of what I am capable of. It’s time to share the wealth!! I have TWO copies of Chris Guillebeau’s new book The $100 Startup to give away. I have already read it (and loved it!) and will be reading it again and taking notes as I determine how best to put my $100 investment to great use. Just leave a comment below letting me know you’re interested – I’ll draw TWO names on July 25th and announce the winners the following day. I already own two copies of the book so I don’t need another, but I just wanted to say that I know exactly how you feel about the sense of responsibility. I recently graduated college and am at the bottom of the career totem pole, so $100 IS a lot for me; but knowing that someone else would invest in me and trust my judgement is so humbling, and I feel obligated to do something huge and lasting, and I’m sure others feel the same. Chris really is incredible, and everyone there is. Awesome weekend! Chris definitely shows how to lead a community. It is an investment and I can’t imagine the joy he will receive watching how we all live up to it. 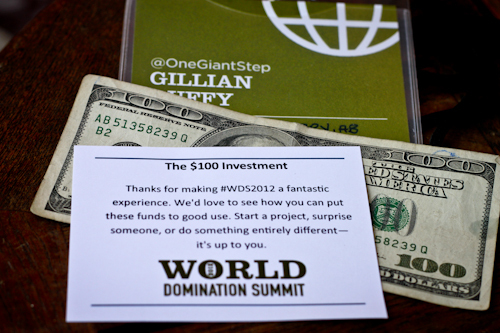 Gillian @OneGiantStep recently posted..Would $100 Change Your Life? Thanks for your post. I was a volunteer at the summit, so I helped hand out the money. As volunteers, we were simply told it was a gift, but didn’t know what it was. It was a LOT of fun to see everyone’s faces. I would like to read the book, then hand it off to another person who will then hand it off to another person, etc., etc. Perhaps we could each write a little note inside the book about what we might do with $100. Great idea with the book – passing it on and including a note! Will definitely put you in the draw!! Oh yes please – I’d love to go into the draw. I was just reading about this book earlier today, and in fact, even checked out their website after hearing about it. I’ve recently been trying to consolidate ideas and plans to combine a life of travel, while continuing to grow financially and living a life that is no longer ordinary. This book would help put me in the right direction! There are plenty of great resources in the book too Lisa. I’ll be sure to get you in the draw! I’d love a copy of the book! Although I’m not sure if you’d ship it to Germany… :-) Either way, great post. There’s always more we could be doing to achieve our goals. I would ship to Germany Ali. And yes, it’s always good to be reminded that our goals are within reach – I understand there is an ebb and flow of inspiration and confidence…I’m glad it’s on the rise for me again! What an awesome give away. I have heard about this book and I think it’s a frat idea. Exactly what I need to get started. When most people think of start ups it seems like you need a fortune to do it so I love that this book challenges that! It really does challenge the notion Brittany. There are plenty of examples in the book of people really becoming successful (and quickly!) while starting small. I’ll get you in the draw for sure! It’s amazing how insignificant even small amounts of money can seem when you’re not paying attention (although $100 is a lot to me still). We’ve had a lot of expenses lately due to a sick cat and car in need of repairs and I find myself being even more conscious of what I spend…how can I make this meal stretch out a little more? Do I really need an iced tea or do I just “feel like it”? And those little decisions are helping us cut back in other areas to help pay for those expenses because…WE HAVE TO KEEP SAVING FOR OUR DREAMS! Carmel, it is those small decisions that are going to see you and Shawn off on your world adventure before you know it! I didn’t know anything about this book until I read this post (& check out the Amazon page). It’s highly interesting. This time last year various bad ju-ju at work led me to consider what I wanted to do with my life, setting up a business was right on the cards – so I set off on a world trip instead. My hope is to take what I’ve learned in life & apply it to new situations just because I’m passionate about it, not because someone else told me I have to because they pay me minimum wage. I’d love to go in the draw for this book, it sounds great. Bad ju-ju = :( I really believe it’s not what you do when the chips are down, just that you DO something! We all have the power to change at least some of our situation – good for you for making a change. Into the draw you go. Cheers Gillian. I’m hoping that that’s the case, that I’m making something out of my own desire to do something for myself & in the process help all of the smiling people I’ve met along the way. $100 is still a big amount in India! The book certainly sounds very interesting and I would love to read through it. Thanks for the good wishes Arti – I have put your name in the draw. Gillian you said it!!! I am so glad I came here today to check in on your journey, because you summed up EXACTLY how I’m feeling about this investment in us at WDS. It’s not a large sum, is it? But it feels HUGE to me! I love the way you have used this to reframe things and blast right through your blocks so you can feel great, and then DO great! I can’t wait to watch!! :) Rock on! Thanks Rebecca. I knew that WDS would send me off and it did just that. I’m excited and looking forward to the future to find out where we end up and just what it’s all going to look like. It was lovely meeting you! Would love to read this book. Always like searching out books like that to see if they are useful or not. I think, Jeremy, that your mind is always swirling with ideas – I think you will like the book! Your name is in the hat. Gillian, I am in the same boat that I need to do better but unlike you guys….I have not even looked, let alone opened my envelope from #WDS. So until i figure my stuff out, I can’t wait to see the bite you take out of the world. You’ll be grand! Ryan, I have a feeling your ‘Operation Sponge’ (is that what you called it?) is going to soak up plenty of opportunity for you this year! Please enter me into the drawing–I’d love to read this book! Thanks. You’re in Mandi! Good Luck! You’re not too late Lindsey! I think the focus need not be on an unconventional life, but on a remarkable life. One that makes you truly happy whether that be living in a small town raising a family, or traveling, or expating, or blogging, or…whatever…just happy. Good luck!